Have you been in those situations where you would be trying to bring a target down from a long distance, but due to a slight miscalculation, you miss, and your target walks? Very annoying, right? Worry no more as today we’re bringing you a solution in a form of the best halo rangefinders we could find on the market today. Fortunately, technology has seen a massive development in recent years and hunters seem to be one of the biggest beneficiaries of this development. With the halo rangefinder, no hunter will ever face the kind of frustrating situations we mentioned above again. They provide accurate distance between a shooter and his target, thus making it easier for him to hit his intended target. In this article, we will be talking about some of the best products on the market today, and we will also look at some of the most important factors you should put into consideration before going on to purchase one of their rangefinders. Let’s go. Before we jump into any particular product reviews, it is always helpful to look at a few important things to take into consideration before buying a rangefinder. We are going to discuss some of them so that you’re cognizant of what to look for in your potential rangefinder. The lens magnification will determine how clear your view will be, and this can be very vital when you’re sighting a target from distance. Most models that are affordably priced have a magnification scope between 4x and 8x, which is generally enough to enable you to sight a target without meddling with the field of view (FOV). 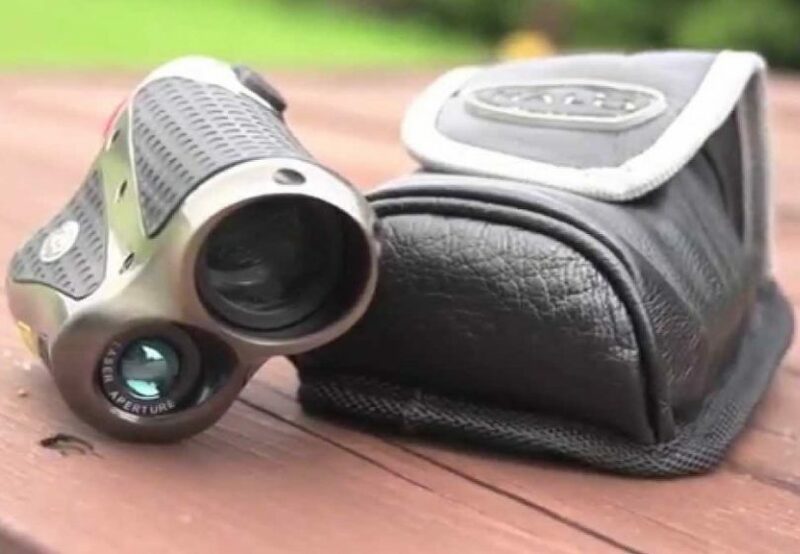 On the chance that you require a rangefinder that has a higher magnification, you should also understand that the higher magnification may cause you to lose a bit of your FOV. Because of this, seeing potential targets off to the side might become difficult. Also, a higher magnification usually increases the price of a rangefinder. Another important feature you should consider is angle compensation unless you intend on aiming from level and flat terrain all the time. Since the odds of you never dealing with a slope are thin, you will need to pick a rangefinder that is fit for computing distances at an angle. Although it is possible to carry these calculations out by hand, you will be risking losing sight of your objective. Having the know-how of how high a bow or a rifle should be aimed can make a huge difference. Based on the gear you want to use for hunting, it is very imperative to consider the weight and size of the rangefinder you want to purchase. The reason for this is you wouldn’t want to be carrying a bulky rangefinder that would tire you out within a few hours of hunting. In bowhunting, for example, it is common to take several tools along with you. You need to bring arrows, quiver, and some other accessories. Therefore the rangefinder you will buy ought to be lightweight and compact as you wouldn’t want to bite more than you can chew and tire yourself out. Your hunting device has to be very durable and should be able to withstand the rigors of hunting. Also, the weather could suddenly become unfriendly sometimes and thus, you need to be prepared at all times. It’s better to choose a rangefinder that is fog resistant and uses the gas purge technology. However, you will also want a device that is resistant to rain, snow, impacts and weather. The good news is that such a rangefinder actually exists. One of the first things to take into consideration when looking to buy the best rangefinder is the budget. Also, it is important to check for quality too, but generally, optical gear is always priced according to quality, which further validates the popular belief that you get what you pay for. Having a budget will enable you to limit your options so that making a decision will be easier for you. Your budget will also determine the included features and maximum range, and it is essential to consider whether you’re hunting with a rifle or a bow. On the off chance that you are utilizing a bow, you may need a rangefinder that can calculate horizontal distance as well so that you can make up for gravity when you’re aiming from a tree stand. Users that use a rifle for hunting will be willing to pay extra for a rangefinder that can measure distances up to 1,100 yards. Although these features may cost somewhat more, it is justified. Now that we have talked about the things to look for before purchasing a rangefinder, we will now look at some of the top products available on the market. Despite the fact that all of the device listed below are great, you will want to find the one that will best serve your needs. 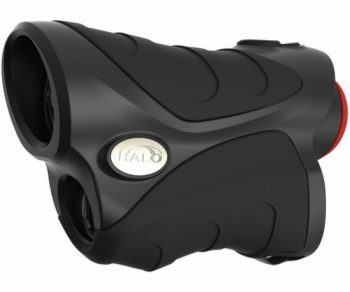 Description: The Halo Z6X 600 Laser Rangefinder is a measurement device intended for golfers and hunters. This incredible device from Wildgame Innovations has the capability to range a target as far as 600 yards away, and it comes in a contoured housing with good texture. Furthermore, it has an easy to use interface that you can operate by a single button that is located at the top, and to measure a distance, all you need to do is press and release the button. Additionally, this rangefinder has an ergonomic and water-resistant construction, which make this device very easy and comfortable to use. The Z6X 600 is powered by a CR2 battery and it displays measurements in yards only. In addition, this rangefinder is a very accurate device as it provides accurate results to within +/- 1 yard. This device is a moderately priced rangefinder, so it is really remarkable that it can maintain precision to within a yard. Besides, the Halo Z6X 600 comes with a scan mode which enables you to range a moving target. The scan mode works exceptionally well, as it quickly changes distance readings as you move around the territory. Also, it comes with a great LCD display that is easy to read, as long as the surrounding light is bright enough. In low-light conditions, it can be difficult to make out the numbers. The numbers can be a bit difficult to read in low light conditions, and that is one of the few downsides of this device. However, the display is sharp and clean, giving you a brilliant image of your target, alongside vital information about the distance between you and the object. Related: You need a powerful battery to keep your rangefinder going when the going gets tough. We recommend you to purchase the Viridian CR2 3v Lithium Battery for its incredible power. 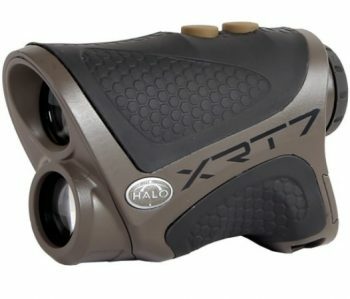 Description: The Halo XRT7-7 Laser Rangefinder is another exceptional, high-quality rangefinder from Halo. It is a purpose top of the line model that provides some additional features that are unavailable on other models. Furthermore, Wildgame Innovations has noticed how some users find it difficult to read the numbers on the display of their rangefinder in the evening or in the morning, so they have accounted for this kind of situation in the XRT7-7 by incorporating an enhanced illuminated display mode which kicks in automatically when lower light levels is detected by the device. In addition, this model has provided a solution the problem faced by hunters when trying to aim from an angle or from a tree stand. This device comes with a built-in AI slope calculation which accounts for slope and thus provide accurate measurements all the time. When you are attempting to measure range at longer distances, having a little boost to your magnification is a definite bonus. With its 6x optical magnification, the XRT7 is perfect for precise target acquisition and ranging, even when it gets close to its maximum range. What’s more, the XRT7-7 comes with a great 6x magnification which makes it easier to acquire and range targets from distance. Also, this rangefinder’s effective range is adequate for calculating distances, and on account of its +/-1 yard precision, you can easily select the best club for each shot, each time you aim. Related: To prevent your rangefinder from being dropped every now and again, we recommend you to purchase the T-REIGN Small Retractable Gear Tether. This pouch is resistant and light, so it will be the perfect home for your rangefinder. Description: For people with a thin pocket but looking to buy a great rangefinder for playing golf and hunting, the Halo ZIR8X Laser Rangefinder is the ideal device. 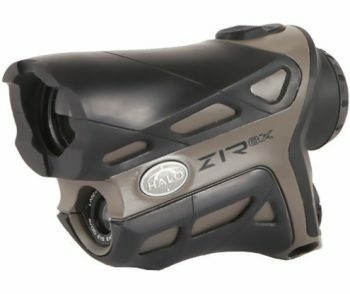 The ZIR8X is very comfortable to use as it comes with a compact and lightweight design. 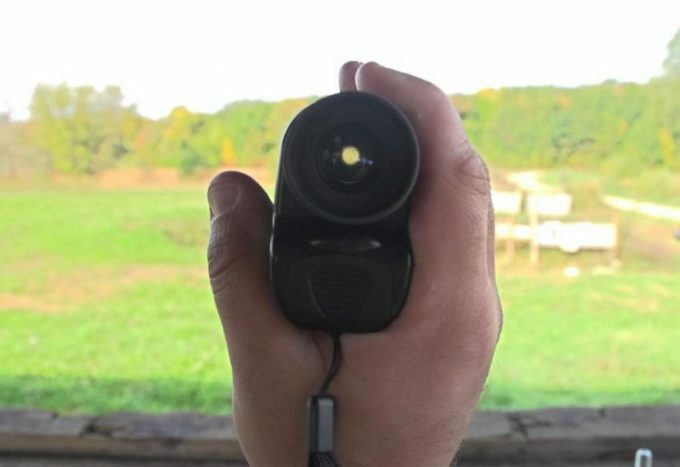 The manufacturer of this device asserts this rangefinder is capable of scanning out to 800 yards. Besides, this device comes with a very useful AI technology, which enables the device to scan continuously and take slope to a target into account. Furthermore, ZIR8X is a very accurate rangefinder as it provides accurate results to within +/-1 yard. Besides, this device is capable of measuring distances as far as 800 yards, which is really impressive for a rangefinder is this price range. Additionally, this device comes with a really good display which is easy to read and provides clear readings. Lastly, this device is very easy to use, and with its 6x magnification, you can be sure it will deliver crisp and clear images every time you make use of it. Related: We recommend the ever-reliable Energizer EL1CRBP Lithium Battery because you need to be able to depend on your rangefinder at all times and that means you need a powerful battery to power it. Description: Wildgame Innovations Halo Xtanium Laser Rangefinder is another incredible device on this list. It can be used in every kind of weather conditions as it comes in a strong, durable and weather resistant housing. Also, this device features a very impressive LCD display which displays battery icon, reticle, and also delivers measurements in meters or yards. Furthermore, this device features a scan mode which continuously scans as you move around the territory and also enables you to range a moving object. Besides, the rangefinder features an angle compensation feature which accounts for upslope and downslope, and no matter where you are shooting from, you can be sure that the accurate distance will be provided to you by this device. 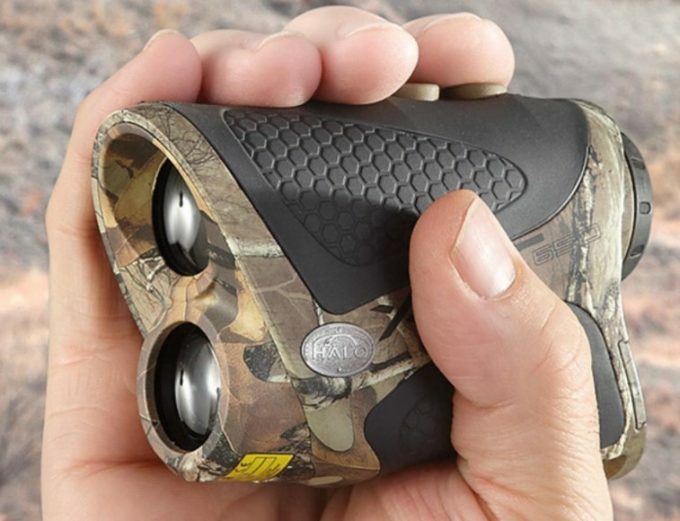 The Wildgame Innovations’ Halo Xtanium Laser Rangefinder consolidates an inclinometer and a laser rangefinder inside a waterproof casing to provide accurate distance calculations wherever you are. The housing features a lightweight, durable, and ergonomic design. It has a textured rubber covering for a non-slip grip and a rubberized eyecup. Included are a nylon carrying case and one CR2 battery. The device comes in a durable, lightweight, and ergonomic built. It features a textured rubber coating to ensure that the device will not slip from your hands even in wet conditions. This device is powered by the CR2 battery which provides lasting use but is a bit hard to find. It provides very accurate measurements. Related: For the ultimate protection we advise you opt for this USA Gear Case Bag for rangefinders. It comes with a shoulder strap and belt loop as well as the extra storage space for spare batteries. The case is also backed by a 3-year warranty so you don’t have to worry that you’ll have to replace it that fast. 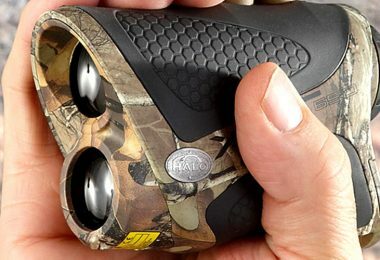 Description: Another excellent rangefinder on our list is the Halo XRT6 Laser Rangefinder from Wildgame Innovations. Made for hunters and golf players, the XRT6 is a very compact and lightweight device that never tires you out when you are out hunting or on the golf course. 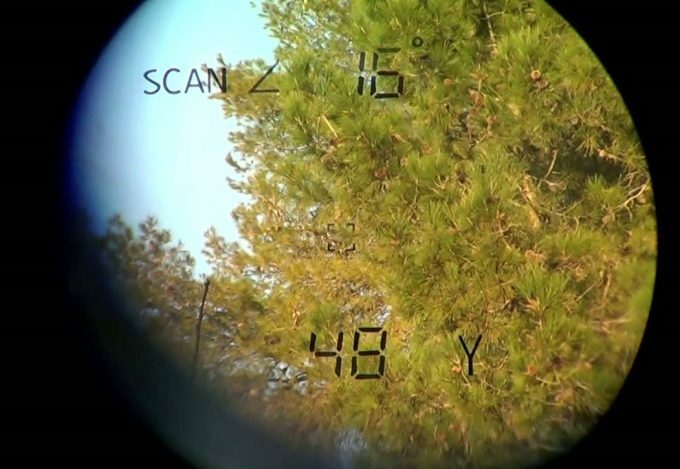 If there is one thing better than using your rangefinder to easily acquire and range targets, it is knowing that your readings are precise for use. The XRT6 rangefinder features a magnification of 6x that can be adjusted, and it also features a continuous scan mode that ensures that you get accurate numbers no matter the condition. 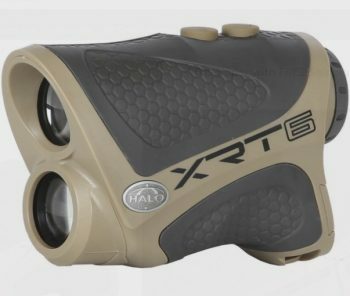 Halo always make it a priority to make their rangefinders lightweight and comfortable as much as possible, and there is no exception with the XRT6. This device is very compact and lightweight, and it has a rubberized grip that ensures that the device will not become slippery in wet conditions. Furthermore, despite being small in size and lightweight, the XRT6 features a remarkable 600-yard range and it also has a precision of +/- 1 yard, giving you the assurance you need to select the best club. Besides, there is no being scared of the weather condition when using the XRT6 due to the fact that the device sports a waterproof design. Related: You need a strong carry case that will protect your Halo XRT6 from falls and minor bumps, so we advise you opt for this Navitech Pro Eva Hard Case for the Halo XRT6 Laser Rangefinder. It includes belt strap and comes with a 12-month warranty. 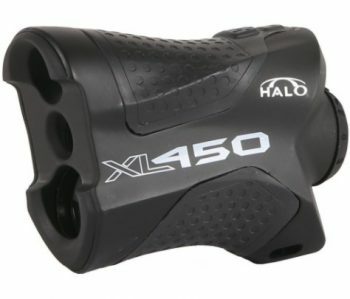 Description: Another impressive budget Halo rangefinder on our list is the Halo XL450-7 Laser Rangefinder. 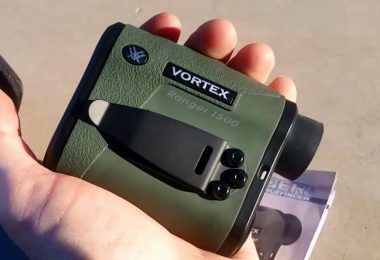 This rangefinder is very simple and easy to use as well as very lightweight which means that it can be easily carried around whether you are on a hunting trip or on the golf course. Furthermore, it comes with a range of up to 450 yards which is relatively lesser than some other models available on the market. Nonetheless, this rangefinder comes with an angle compensation feature which accounts for slope when you are aiming upslope or downslope and ensures that you get the accurate distance readings regardless. Also, the device comes with a wrist wrap and a CR2 battery. While the battery is decent and will allow several uses, it is difficult to find, sadly. The rangefinder has a magnification of 6x which is perfect for any rangefinder. While the LCD display on this device is great for the price, it is difficult to read in low light conditions as it doesn’t have an enhanced illuminated display. 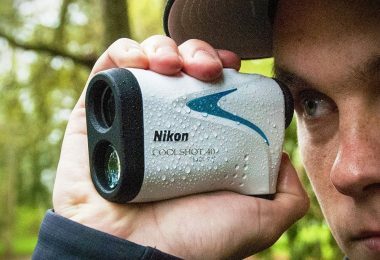 Additionally, this compact and lightweight rangefinder has a waterproof built. It can be used when the moisture level is high without getting damaged and that is a big plus. Besides, the rangefinder has an auto-shutoff feature which would shut the device off after 20 seconds of being inactive. Related: Customers who bought the XL450-7 also bought the ever-reliable FitSand (TM) Travel Zipper Carry. 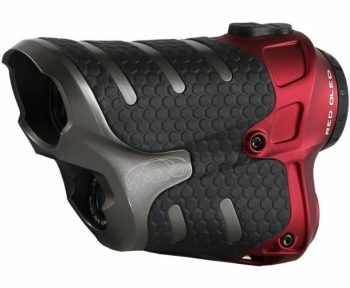 It is designed specifically for XL450-7 laser rangefinder and is known for its lightness and great protection. 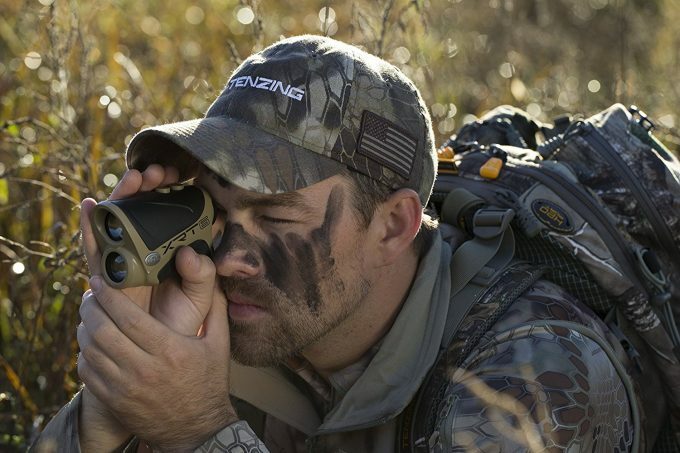 Wildgame Innovations is one of the best companies in the business when it comes to the manufacturing of quality rangefinders, and on the evidence of the products reviewed in this article, their spot on that list is truly deserving. With so many models from different manufacturers nowadays, it isn’t easy to choose a perfect rangefinder. However, all the products in this article are sure to be perfect for you as they are known to be very accurate, durable, and affordable as well. Do you own any of the products we listed above? Share your experience with us in the comments session.